Nothing hits the spot like a well crafted burger, and fortunately for Nashvillians, we have many phenomenal options. Here are three of our current favorite burger spots and the burgers you need to put on your must try list! The Pharmacy Burger Parlor & Beer Garden believes in serving the very best products at the very best value. 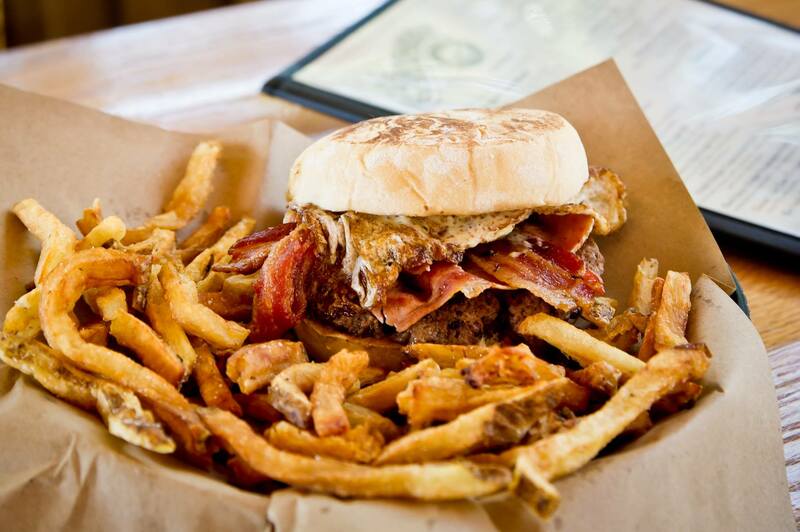 We use 100% Tennessee-raised beef for our legendary burgers and 100% pure cane sugar in our sodas. We boast Music City’s hardest-working kitchen that grinds, stuffs, and smokes every wurst (sausage) that we serve. We prefer to craft our condiments as opposed to purchasing them. Our beer selection is the most unique and meticulously-selected you’re likely to find. Our biergarten is so welcoming and beautiful, that you will find yourself listlessly wasting hours at a time without noticing. We are proud of our accolades, but take more pride in our community. A great day is when everyone leaves happy. We are always glad that you came, and even happier to see you return. A conversation in 2008 birthed the idea of Burger Up. That conversation began with small talk about what kind of business would fit well at the corner of 12th and Paris, leading eventually to talk of a quality burger place – a community-driven restaurant – a place where people of all ages would feel welcome – a place to take the kids out to dinner – a place appropriate for a business lunch, first date, or an anniversary. Only 18 short months later, the doors of Burger Up were opened for the entire community to enjoy. For those on the never-ending quest to find the best burger in town, Burger Republic presents a quality and respect to be reckoned with. In addition to the use of only certified Black Angus beef, what makes the burgers at Burger Republic stand out are the inventive accoutrements, such as Vermont aged white cheddar and Guinness-braised bacon for The Burger Republic burger and lump crab and hollandaise sauce for the Burger Oscar. For an adventure in the capabilities of what can be sandwiched between two brioche buns, this is the place to go. (A true taste of the Volunteer State. Certified Angus Beef® burger glazed it with Jack Daniel’s Honey Bourbon and topped with maple glazed Benton’s bacon, Jack Daniel’s smoked ketchup, American cheese and Memphis BBQ rub dusted onion straws.